A guide for drawing horizontal lines on a drafting table. It is also used to guide the triangle that draws vertical lines. 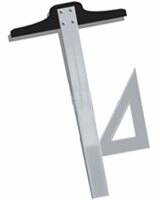 Its name comes from the general shape of the instrument where the horizontal member of the T slides on the side of the drafting table (see illustration). The tactile surface characteristics of a work of art that are either felt or perceived visually. Also called intermediate colors, these are blends of primary and secondary colors. 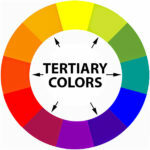 Colors such as red-orange and blue-green are tertiary colors. Occupying or giving the illusion of three dimensions (height, width, depth). A sensation of space which seems to have thickness or depth as well as height and width. A view of a face or any other subject which is half-way between a full and a profile view. Crude, small pencil drawings used to develop the initial concept for a design. Acronym for Tagged Image File Format, a standard graphic image file format usually generated by scanners. Developed by Aldus and Microsoft. A hue with white added. Pink is a tint of red. An oxide used as a white pigment of great permanence and covering power. Usually extended with other whites to improve its brushing and drying properties. Decorative painting on tin objects. The change or passing from one condition, place, thing, or activity to another; the passage linking one subject, section, or other part of a composition with another. French for “fool the eye.” A two-dimensional representation that is so naturalistic that it looks actual or real (three-dimensional.) This form of painting was first used by the Romans thousands of years ago in frescoes and murals. A high quality oil paint thinner and solvent. Having two dimensions (height and width); referring to something that is flat. A measurable distance on a surface which show height and width but lack any illusion of thickness or depth. The study and process of typefaces; how to select, size, arrange, and use them in general. In modern terms. typography includes computer display and output. Traditionally, typography was the use of metal types with raised letterforms that were inked and then pressed onto paper.